Origin and Habitat: 75 km North of Karasburg, Namibia (Type locality). Habitat: Its natural habitats are rocky areas and cold desert. 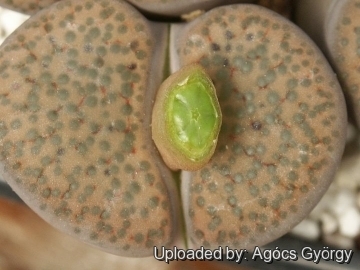 Description: Lithops fulviceps is an orange-brown species generally smaller than most Lithops but its shape follows the same pattern of a cordate (heart-shaped), bifurcate body of two leaves. The bodies (paired leaves) are truncate in profile, with a cleft nearly to the base. Faces flush, elliptic-reniform, slightly rugose, variable in colour. This species usually do not shows clearly evident margins, windows, channels and islands, but the top of the leaves are more or less reticulated by slightly impressed grooves that sometime form a conspicuous network, the usually very numerous and slightly raised dusky dots like miniature blisters over whole face. The patterns of colour and dots on the face is more or less regular within certain ranges of similarity. For this species, the dusky dots are very specific ranging in colour from dark grey through browns to purple. Desmond Cole field number C220: This population distinguishes for having large dots, red lines and rust body. It is a medium sized elliptical plant about 30 X 23 to 40 X 27 mm wide, It branches easily and forms clumps with up to 10 (or more) heads, but usually less. It is somewhat variable in colour, usually uniform rusty yellow-brown to orange-red-brown, but also grey-brown, grey with greenish or pinkish or purplish tinges, but otherwise very uniform. Dusky dots are dark grey-green to blue-green. Shoulders often as for the face but duller. Lithops fulviceps C170 40 km N of Karasburg, Namibia: reddish brown heads, red lines. Lithops fulviceps C219 (syn. lydiae) TL: 60 km N of Karasburg, Namibia: dusky pinkish grey. Lithops fulviceps C220 TL: 75 km N of Karasburg, Namibia: large dots, red lines, rust body. Lithops fulviceps C221 85 km N of Karasburg, Namibia: red brown with red dashes and dots. Lithops fulviceps C266 65 km N of Karasburg, Namibia: extra red large dots. Lithops fulviceps C278 70 km W of Upington, South Africa: big spots. Lithops fulviceps C284 15 km NE of Karasburg, Namibia: ochre bodies, many red dots and lines. Lithops fulviceps C363 Locality unknown (Namibia) cv. Aurea (Y.Shimada) D.T.Cole: The plant originates in cultivation either in USA and in Japan, it is yellowish-green to or creamy-blue green in colour with white flower, but is otherwise the same as var. fulviceps. The usky dots are raised, dark dull greyish or bluish green. Rubrications (if present) is very fine pale brownish-orange. Lithops fulviceps var. lactinea D.T.Cole: (Syn: Lithops. geoffreyi, Lithops verruculosa) Cole number: C222. It is endemic to a very small area where it is found growing on a gentle limestone slope. This plant except for the face colour is the same as the type. Face is opaque, milky bluish or greenish or pinkish grey-white or grey with dusky dots mainly bluish green. Shoulders milky grey-white, or bluish grey-white. Rubrications yellowish or reddish orange, sometimes barely visible. It is a medium medium to large plant up to 40 X 30 mm wide. Usually few branched with up to 4 heads (or more in cultivation). Lithops fulviceps var. lactinea C222 TL: 100 km ESE of Keetmanshoop, Namibia: pinkish milky grey, red lines. Lithops fulviceps var. laevigata D.T.Cole: Cole number: C412 This variety is quite uniform and distinguishable for it more smooth surface, as if polished. It has small subcutaneous dots, not the large raised dusky dots which characterize the type variety. The plants are also distinctly smaller in all dimensions, with rarely visible rubrications. The face and shoulders colour is always rusty brown, sometime with few distinguishable islands. The channels (if present) are dark olive-green and obscurely transluscent. Lithops fulviceps var. laevigata C412 TL: 90 km NE of Pofadder, South Africa: very odd small convex form. 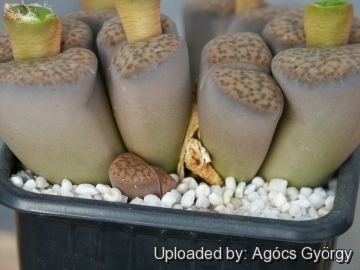 2) Achim Hecktheuer (2008) “Mesembs, mehr als nur Lithops” Books on Demand GmbH Norderstedt. 3) Desmond T. Cole & Naureen A. Cole, Uwe Beyer, Yves Delange (2008) “Les Lithops” SUCCULENTES Spécial 2008 AIAPS (now Terra seca). 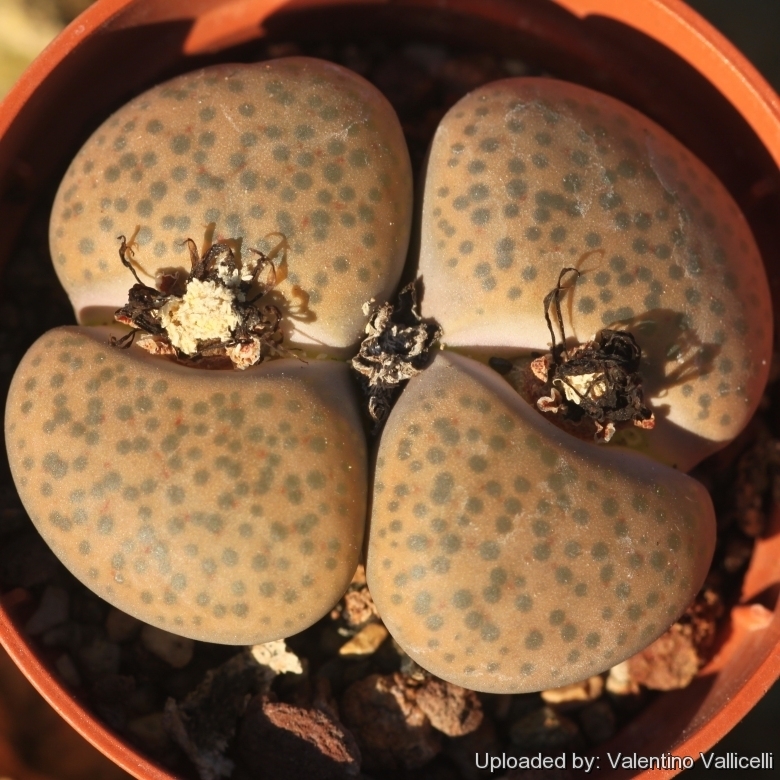 4) Desmond T. Cole & Naureen A. Cole (2005) “LITHOPS Flowering Stones” Cactus & Co. Libri. 5) Yasuhiko Shimada (2001) “The Genus Lithops” Dobun Shoin. 6) Rudolf Heine (1986) “Lithops - Lebende Steine” Neumann Verlag. 7) Bernd Schlösser (2000) “Lithops – Lebende Steine” Praktische Anleitung für die Zimmerkultur. BussinessPoint MEDIA. 8) Steven A. Hammer (1999) “Lithops – Treasures of the veld” British Cactus and Succulent Society. 9) Desmond T. Cole (1988) “Lithops – Flowering Stones” Acorn Books CC. 10) Rudolf Heine (1986) “Lithops – lebende Steine” Neumann Verlag. 11) David L. Sprechman (1970) “Lithops” Associated University Presses, Inc.
Cultivation and Propagation: Lithops fulviceps needs an open mineral, fast draining mix and the maximum amount of light you are able to give them. The basic cultivation routine is: Stop watering after flowering. Start watering after the old leaves completely dry. (Usually late March or Early April) Water freely during the growing season, soak the compost fully but allow it to dry out between waterings, no water when cold. Some growers fertilize frequently, some hardly ever. Keep them dry during the winter. Nearly all problems occur as a result of overwatering and poor ventilation especially when weather conditions are dull and cool or very humid. This plant is best for a well lit area (Bright shade to full sun). But don't be afraid even the best growers have plants that mysteriously dry up, or leave during the night. Comment: After flowering in the autumn and extending through winter season the plant doesn’t need watering, but they will still be growing, the new bodies will be increasing in size extracting water from the outer succulent leaves, allowing them to shrivel away. In fact the plant in this time extracts water and nutrient stored in the outer succulent leaves, allowing them to dehydrate relocating the water to the rest of the plant and to the new leaves that form during this period until the old leaves are reduced to nothing more than "thin papery shells".